In the busyness of daily life, it can be hard to find meaningful ways to connect with our kids. We try to have real and honest conversations with them at mealtimes, in the car, or at bedtime, but often it feels like we’re talking at them instead of with them. How are we supposed to really get to know our kids and learn what is on their heart when trying to get them to open up and share with us can often feel like pulling teeth? Enter, the mommy and me journal. I started one with my daughter over a year ago when she was just starting to read and write. She just finished up 1st grade this year, so our journal is getting a lot more use these days as her reading and writing has greatly improved. And I’m finding it so valuable to help us connect with each other. 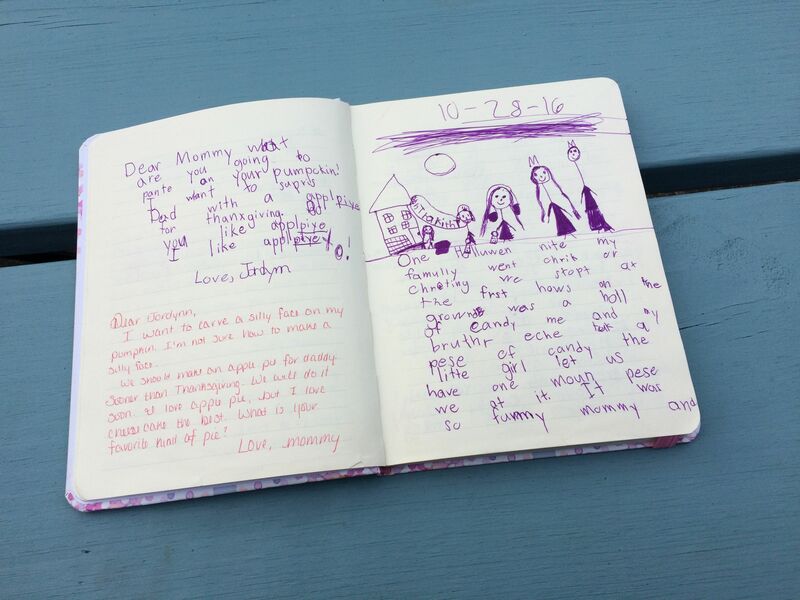 A mommy and me journal can be used to share silly times. Writing can remove fear and help kids process. During this school year, I really began to understand the power of writing to each other. There was an issue at my daughter’s school. An issue that was so big and important that her teacher called me and talked to me about it for nearly half an hour. I was shocked and horrified and so confused after talking with her teacher. How could my daughter be involved in such a terrible situation? When I picked her up from school later that afternoon she knew she was “in trouble”. She immediately closed up and wouldn’t talk. She cried, she whined, but I couldn’t get her to tell me anything about the situation. I wasn’t mad at her and had tried everything I could to explain this to her. The situation was terrible, but I honestly could not believe that things had happened the way the teacher described. I really needed to hear the story from my daughter. The teacher had mentioned that she too was shocked by the situation, but had been unable to get my daughter to discuss “her side of the story” so she was only able to act on what she had been told by another child. My daughter couldn’t find the words to tell either of us what was going on. But then I got the idea to ask her to write out what happened. She didn’t have to tell me to my face. I didn’t even need to be in the room. Just write the story down. And she immediately smiled and agreed. I handed her a pen and some paper and let her be. Sometimes my daughter tells me a story in our journal, complete with illustrations. When she was done she handed me the paper and pen. I read her story and things immediately started making more sense. I wrote back several follow up questions and we passed the paper back and forth for a while to help me truly understand the issue. And finally, my daughter’s fears had crumbled enough that we could actually speak honestly and openly about the situation. The entire issue was a giant misunderstanding that ballooned into a huge deal because my sweet daughter was too afraid to speak up for herself and simply explain that she misunderstood. My daughter, I am discovering, is so much like myself. I’m not quick on my feet. In the heat of the moment, I’m more apt to shut down than to speak up for myself. If someone criticizes me or accuses me of something I clam up, whether what they say is truthful or not. But the written word is powerful. Give me a chance to think and ponder and then write out my response in a thoughtful way and I can come back with a great response. But it is not immediate and fast and it can’t be face to face. There is too much pressure face to face. Which is why I love our mommy and me journal. We can have real, in-depth conversations about the things she’s struggling with, difficult questions she’s pondering, and even the good and exciting happenings in her life. While I do think it is important to still have face to face conversations, I feel like relationships can grow and deepen in different ways when you write to each other. 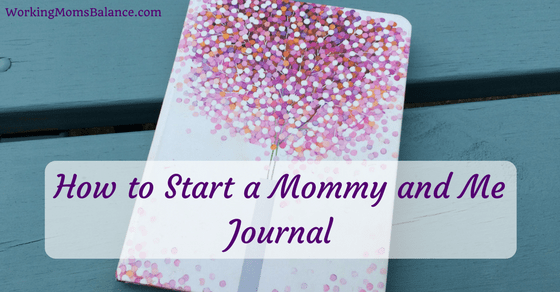 It is not difficult to start a mommy and me journal. You can grab any old notebook and get started. But I wanted ours to be special so I scoured Amazon in search of a fun and girly journal to use. I found one with sparkles and pink and knew it was just what we needed. When the journal arrived I wrote a short note to my daughter explaining the purpose of our journal. I sat with her to explain what I wanted to start and handed her the journal and a pen to get things going. We certainly don’t write to each other every day. Sometimes we go weeks without picking up the journal. But we each have a spot in our rooms where we keep the journal. When one of us has something to share, we can grab the journal from its spot and write out our message. 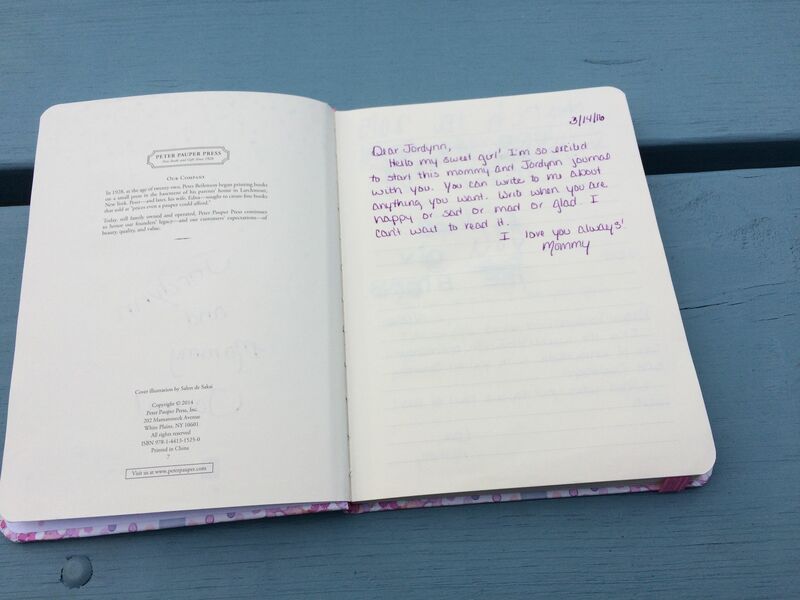 We then leave it in the other person’s journal spot so they can read and respond when they get a chance. Often we just discuss silly things. There are lots of giggles and laughter with our journal writing. For a long time, my daughter decided that she wanted to be called Ana in our journal, so she signed each of her notes as Ana (her name is Jordynn). I try to always ask an open-ended question as I close each “letter” to my daughter to help her come up with something to write back to me about. Sometimes she answers my questions and sometimes she writes back on a completely different topic. There are no real rules for our journal. We’re allowed to share and ask whatever we want, whenever we want to. It is such a fun and special activity that we can do together and it takes so little time. I truly believe that it helps to build our relationship and stay connected with each other. I can’t wait to see what the future holds for our mommy and me journal. I anticipate that as we use it more and as she grows older we will share many wonderful things with each other in our journals. The first note I wrote in our journal. Short and simple. 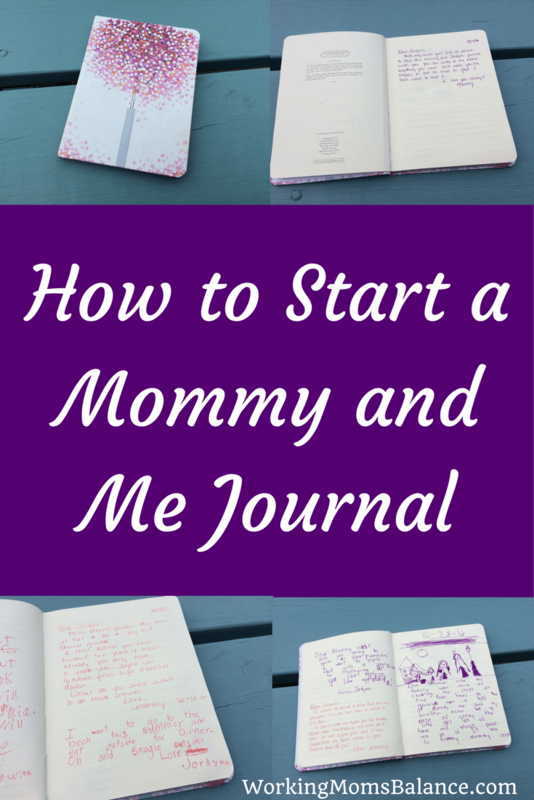 Have you ever started a journal with one of your children? Have you noticed that allowing your kids to write things out helps them to process and share difficult circumstances? Please share your stories in the comments. If you think a mommy and me journal would be great for your relationships with your children begin writing to them today. This is a really neat idea Tracy! I think I will start one with Abbie Mae. I love this idea! Thanks for sharing. I think my boys will even love it! Can’t wait to try it. Thanks! What a wonderful idea! My daughter talks all the time. But sometimes the really personal stuff she struggles to talk about. I think she would love to do this. Plus she enjoys drawing and being creative too so that would give us another way to save all her “notes” she like to make for me. What a great idea!!! My daughter has a birthday next week and I’m going to give this as a birthday present. I can see how this will benefit both of us in many ways. That is a great idea! I hope the two of you have lots of fun with it. That is a great idea! Thank you. How old was your daughter when you first started the journal? We started it toward the beginning of 1st grade (she had just turned 7). Her writing was definitely short and harder to read then, but it still gave her practice writing and helped us connect in that way. She’s now in 3rd grade and we can easily write several pages of notes back and forth to each other. The journal has grown with her writing abilities.